That somewhere deep inside - peace realms supreme - you only have to look within. and dissect magical moments when you see them. We all need a little of that - you are mine. but I'll also teach you how to know when to buy them for yourself. I hope you gift yourself often. art galleries when you can. A healthy soul is filled to the brim with both. balanced on that one - it's tricky - but it can be done. Like an orange you have to peel away the skin to find real substance. it's only zest - and the part that gets discarded. I will teach you how to peel oranges. in sunshine AND when the heaven's open up . Both can be harmful - both are essential and filled with beauty. because I'll also teach you to forget it from time to time. and allowing you to wipe them dry so that you always know you have healing powers. and that a gentle hand given when needed can save a life. you will give it freely when I do need it from time to time. when to say that too. And that we are closest to our maker when we are kind to them. I'll probably tell you I love you at least once a day for the rest of my life. You do not have to reciprocate on that one. just because you know you're worth it. And that you will look upon this imperfect world as a privilege to be a part of. As you've graced my life - so you will grace many many other's while walking upon it. It's a glorious place made all the more so because of your entry. the tools to make it a happy one. learn something new - and by 10 years old you will probably know more than your Mother. teaching me far more than I could ever presume to teach you - I know that. chicken is always just a little too dry. My super powers will fall by the way side - hopefully I'll have taught you not to gloat when that day arrives. But first I'll teach you how to sleep through the night. Words used for this post ? Don't ask - menopausal moment - which makes me overly sentimental................it's go on meds or write you'll have to indulge me on this one. Not quite sure how the heck it even happened - furniture usually inspires me to paint - not to write odes. Especially when my little girls are now in their 30's !!! AND thanks so much Hometalk for the twitter mention !!! And don't forget to leave a comment HERE for a chance to win this package - winner will be announced on Sunday !!! Time to party with these fabulous Hostesses !!! Oh, my! Not only are you talented with paint, you are a poet too! 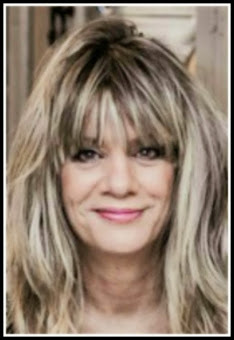 Beautiful, both the transformation and the Ode...as a grandma (actually, my name is GaGa) I read those beautiful words and thought that some of that applies to all of us grannies in that we can also help Mom teach a few of those things (as well as us learn quite a bit in the process). You are very talented and have a beautiful heart. Thanks for sharing! What a beautiful post, I think you're waiting for a little granddaughter. this is beautiful, so much so it gave me chills, amazing! Beautiful! Both the hutch and the ode! I bet that was "fun" applying the backing. 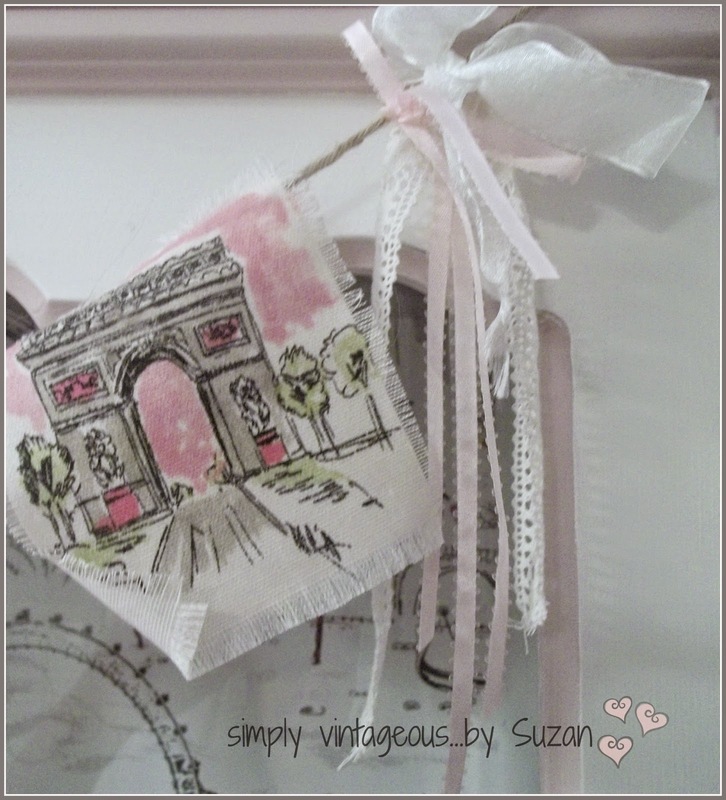 I'm sure that little endeavor is worthy of a blog post....and I did notice that the Eiffel tower is perfectly lined up! Then he hammered holes right through it putting it back on. awww Laurayne - you weren't supposed to cry ! Really lovely -- both the hutch and the ode. I think this might be one of my most favorite pieces you have done. Love it what a grand re love of this chest. I love your poetic words so sweet and comes from your heart. Great post. Touched my heart. 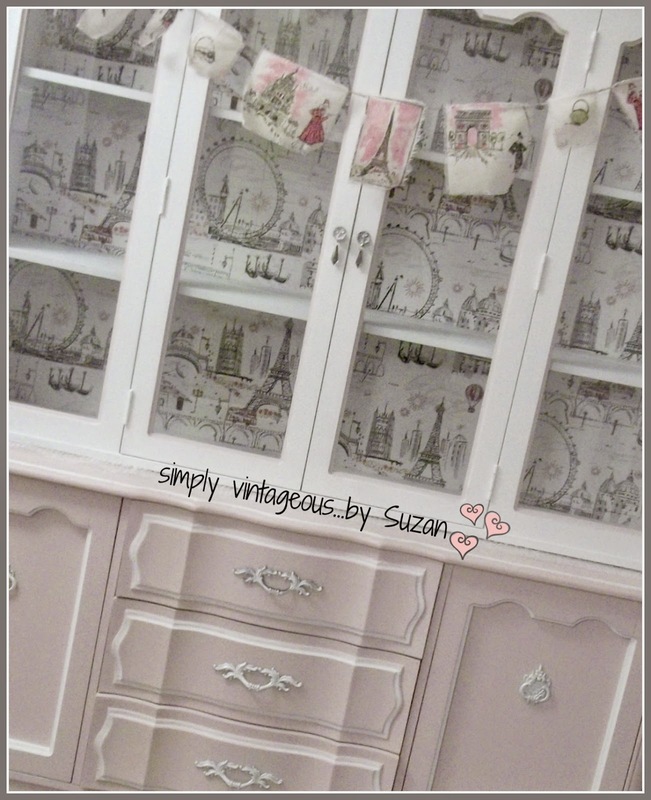 Beautiful...the words and the hutch! 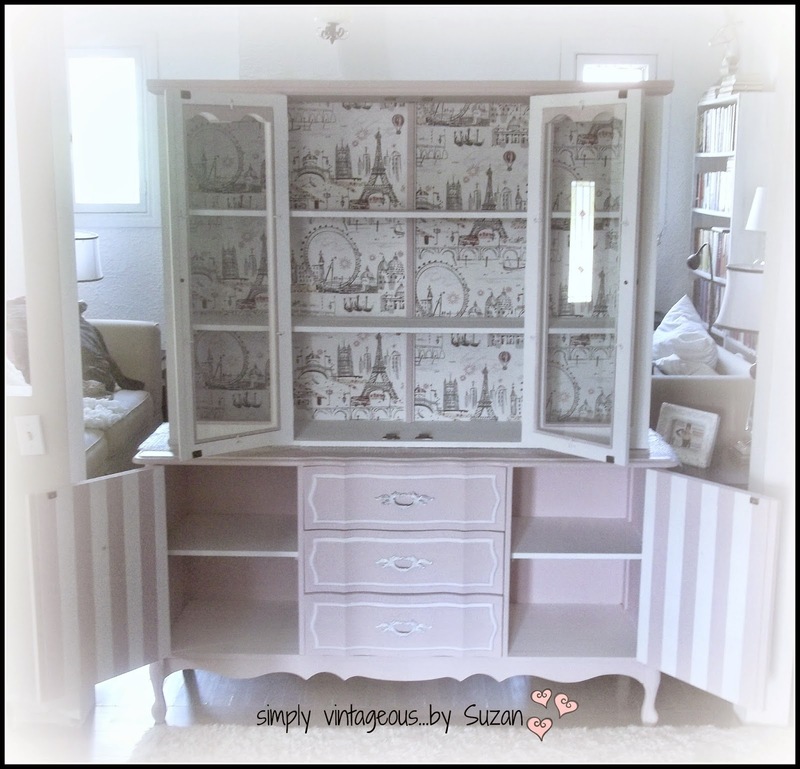 I have a similar hutch that was my mother's that I have been wanting to paint. You've inspired me to do it by showing me how beautiful it can be. Beautiful and beautiful. Being sentimental does not need to be explained away or medicated. It's best served warm to close friends and like thinkers...like us. BEAUTIFUL saying and BEAUTIFUL hutch transformation!! I love that cute banner too! Oh, Suzan, (I feel like I know you personally and can call you by your first name!) PLEASE PLEASE turn this poem into a children's book! PLEASE!!! And thanks so much for your kind words ! Beautiful! 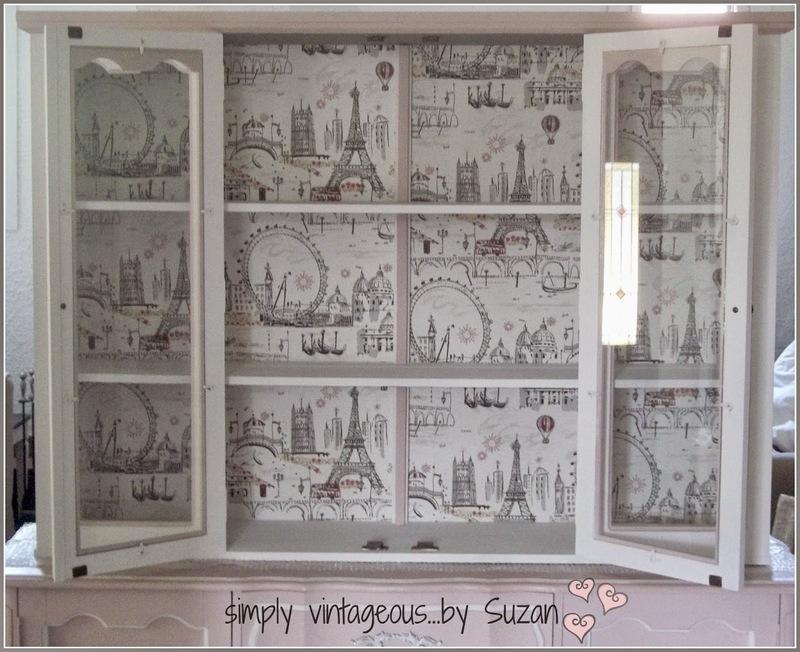 Oh and the cupboard is gorgeous too! How precious to read this today as my first great niece is being born! Annabel should arrive at any moment and I plan to send this to her mother. Your words are beautiful and inspiring. The cabinet will be priceless. I usually leave here laughing, but this one brought tears to my eyes. 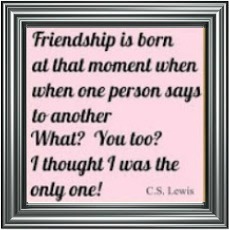 Beautiful words my friend...just beautiful! It is lovely. Have a blessed evening...and by the way, love the piece you created. You may have been blessed by your children, but indeed they have been blessed by you. Circle complete. Lovely on all counts!! Aren't I lucky to get a twofer today, a gorgeous hutch and a charming ode! You need to write a children book. Love the color and the stripes inside. Beautiful words, beautiful furniture. Sigh. Just lovely. Thanks Suzan. This is so beautiful, both the letter and the hutch. 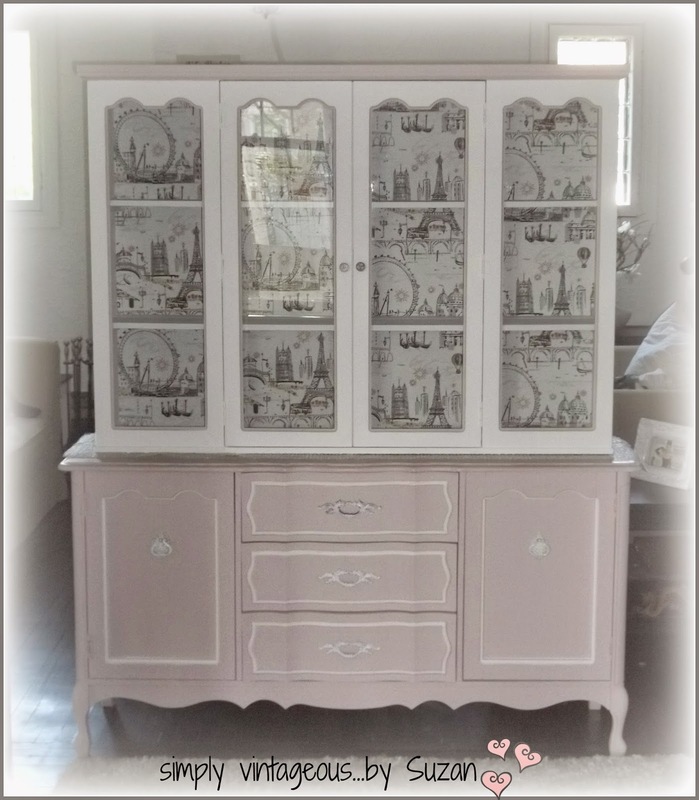 Beautiful post...and a beautiful hutch!! Wow, and Wow! I am so impressed with the hutch and your sweet words to a baby girl. Love it! Pinning. I just spent some time with my mom, who will be 78 soon, so this is about me. I also spent some time with my daughter who will be 40. This is about her. Or maybe this is about my 8 grandchildren she has given me, ages 23 down to 1. Perhaps it will be about their children when the time comes. Surely, it is about all of us. Thank you. 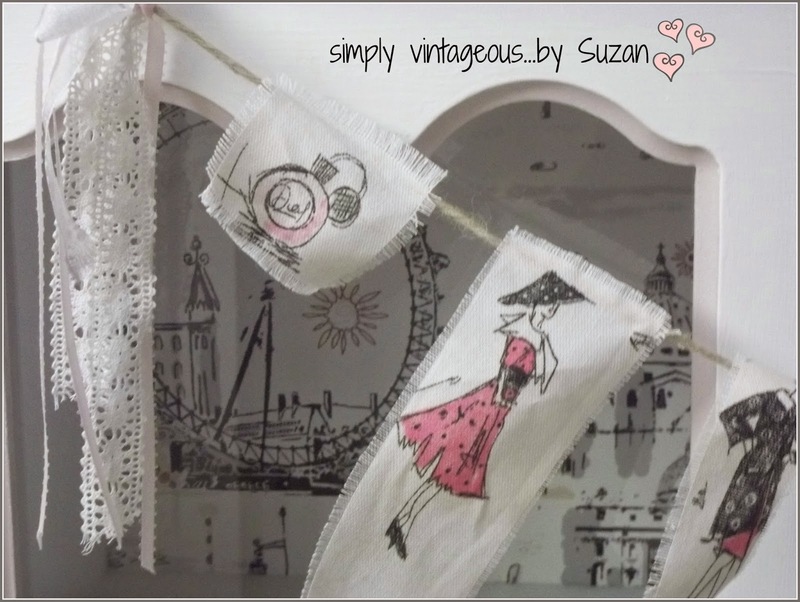 Suzan, that is so beautiful! I can't believe your wrote all of that yourself! YOu are amazing. I am going to be so bummed when Jacob realizes some day that my superpowers are not real. *sigh*. Oh, my goodness. I couldn't wait to see the pictures of this lovely piece of furniture. I scrolled through them, drooling and envious. Gradually, I noticed the words. Then I slowed down and began reading them. I had to go back to the beginning and I read with amazement. You are so talented on many levels! 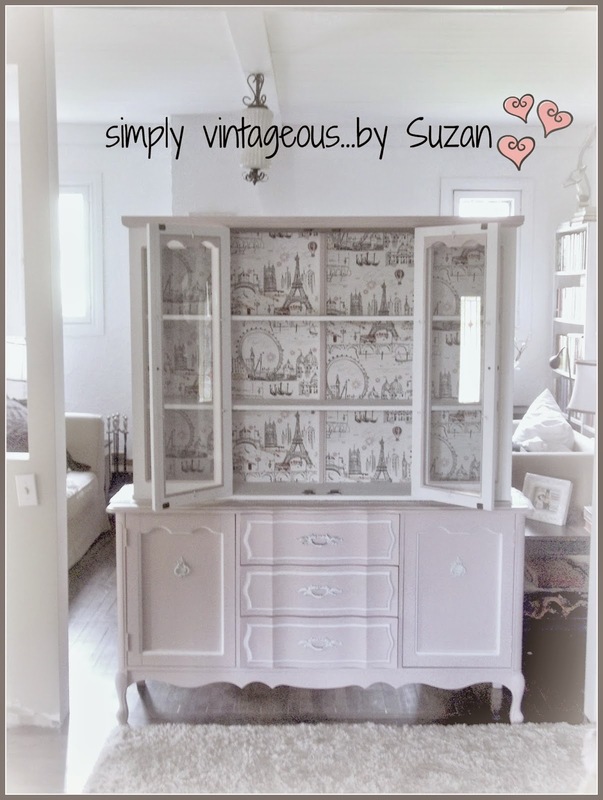 You've touched my heart Suzan....just beautiful, along with your gorgeous piece of furniture. 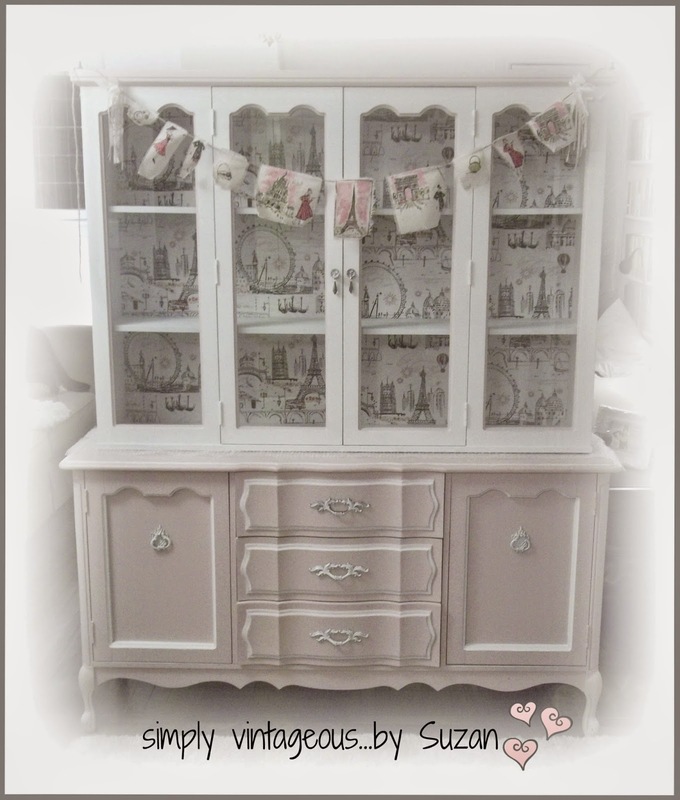 Oh, this is so pretty Suzan, the Ode and the hutch! They are a perfect match, sweet, adorable! Wish it WAS fabric - I'd make pillows ! Awwww. This is so special! 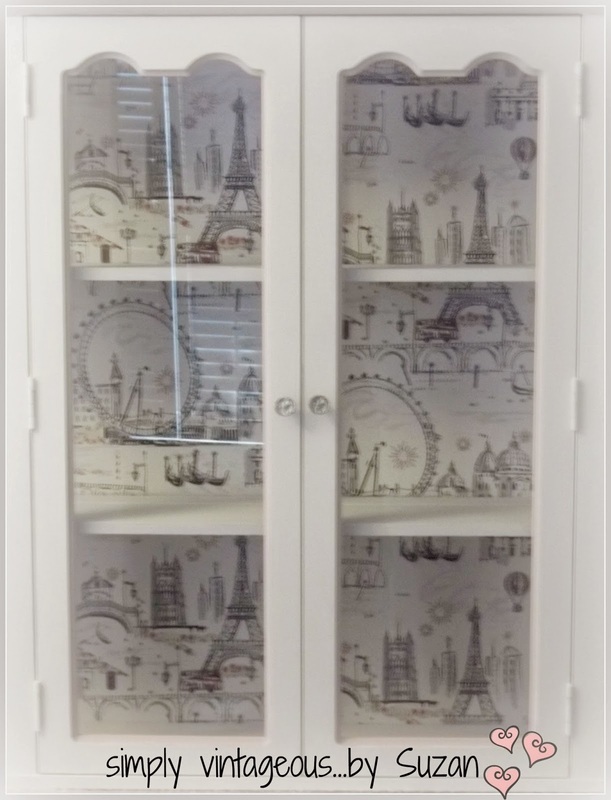 I've been wanting to do a china cabinet for a little girl. That fabric is just perfect. Your Ode is beautiful -- and so heartfelt. I think those hormones fueled something wonderful. The pink cabinet is perfect! 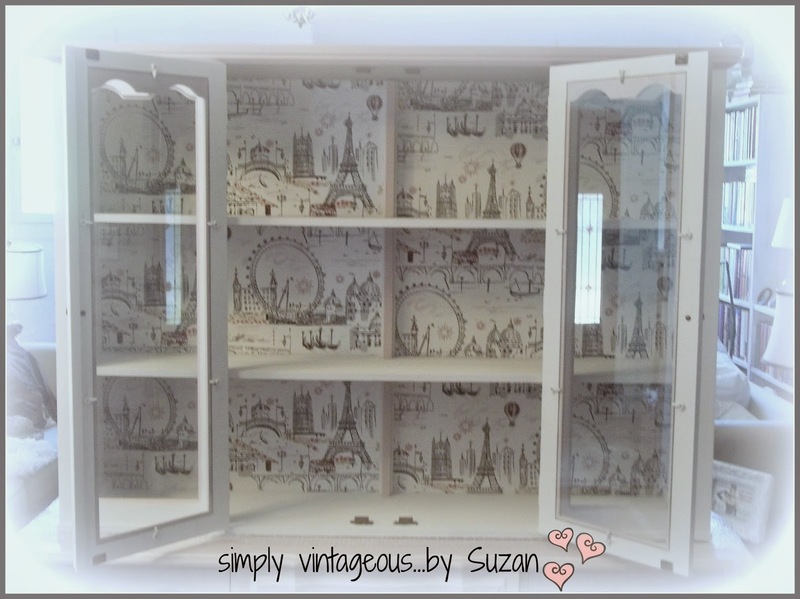 Your hutch is so gorgeous! Wonderful work! Thanks very much Gigi ! Create away, dear one. . .
whether in words or works of art!!! You're A M A Z I N G!!! P.S. . . .I hear the voice of furniture, also!!! Thanks SO much fellow furniture whisperer ! Your ode is so touching and sweet, Suzan. And your hutch is truly the most adorable piece of furniture I've ever seen. This is so stunning! It would have been my dream to have this in my room when I was a little girl! Thanks so much Nicole !!! Hey Suzan! 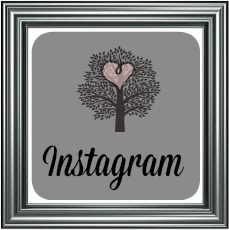 I've been on a bloggy break so I'm playing catch up. I love, love, love this post. I think it's my favourite one of yours ever! Both for the pink hutch and the writing. You never cease to amaze me. Any little girl in your world is a very lucky one. I am speechless. That was beautiful. And the hutch is the sweetest thing I have ever seen. Gorgeous! Both the cabinet and the poem. Perfect for the perfect little girl! Thanks for sharing with SYC. Oh, I get to the menopausal moment and I totally get it!! LOL! I was watching my nieces this week (3 and 2) and I start blubbering about how much I miss my kids (boys) when they were little. Strangely this is a girl thing, because my 3 year old niece totally gets it too! LOL! Absolutely incredible! What a stunning piece! 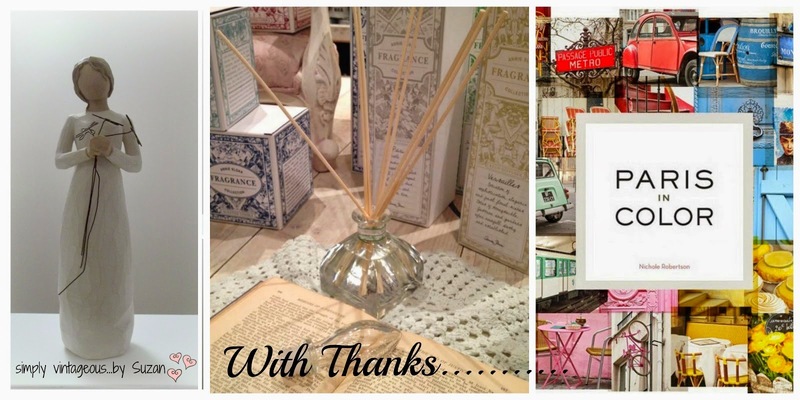 Such a lovely post thank you! How kind - thanks so much Jennelise! The hutch is very charming! 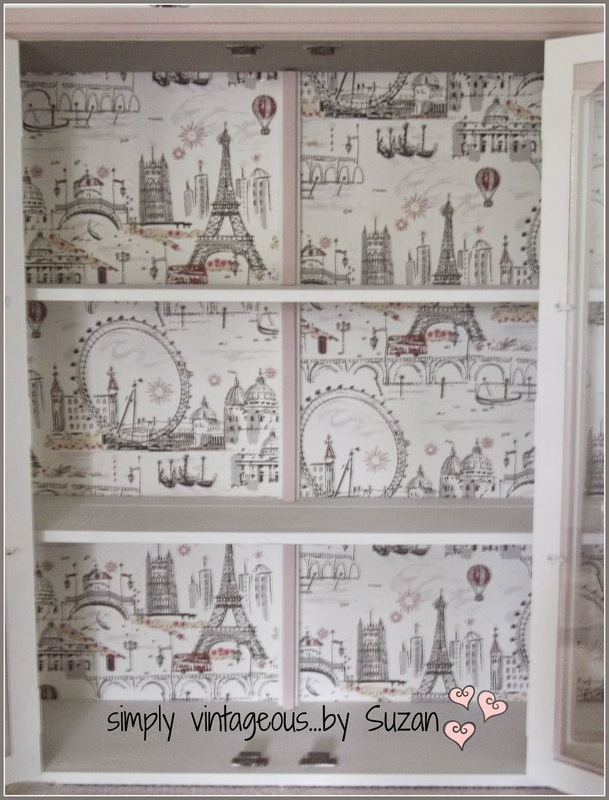 I especially love the wallpaper backing. Beautiful! Your poem is very touching too! Love It! 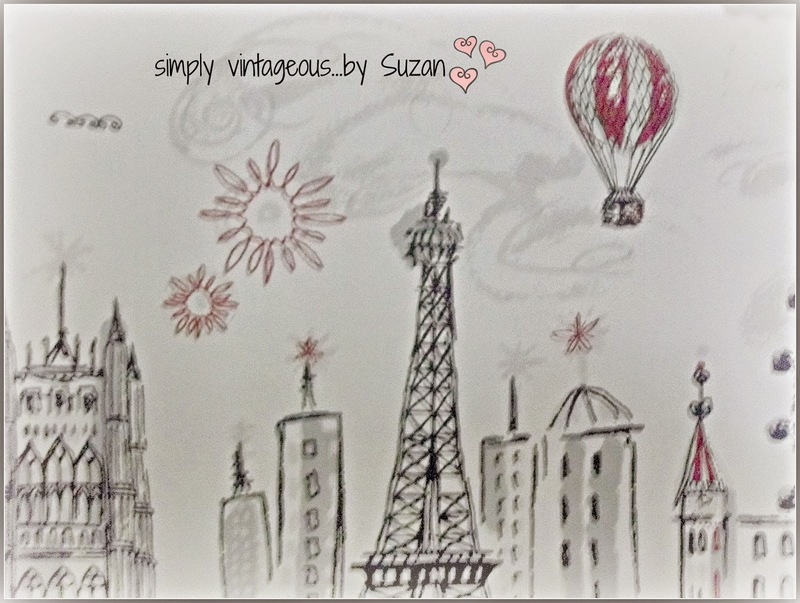 Suzan, you amaze me, not just with your painting skills but your way with words, (funny or serious). Always a joy to see and hear what you've been up to. Great post! Wow...it's GORGEOUS! And I love the paper you chose for the back! Fantastic ideas for the paper you choose! love it. 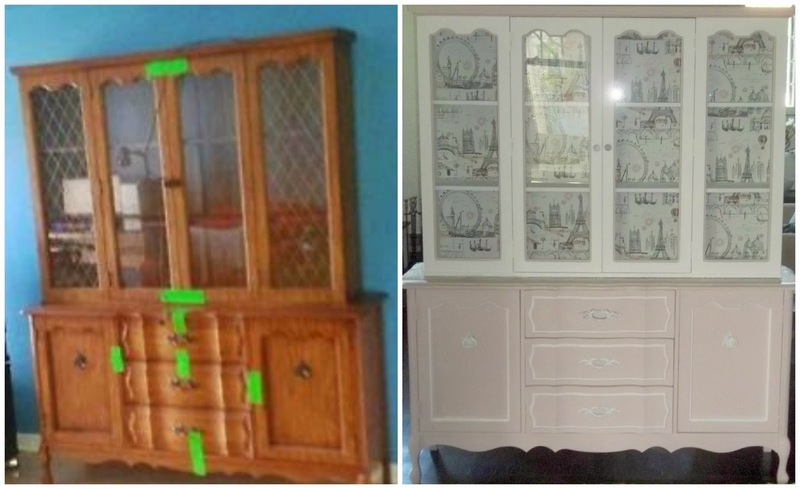 I have something similar i did recently, this is very inspiring, I may do this to my Hutch. Thanks SO much Maria ! A PAINTED CUCKOO CLOCK ! I LOVE silver leafed furniture !